Unify all ores, metals, and materials from different mods (list below). Completly automated, plug & play! By default the mod detect which ore-types are needed. But you can activate or deactivate all supported Ores in the config file if you want to. More coming soon. If you have an idea for another mod support, write a comment! Some ores occur more frequently in certain biomes, such as gold in mesa biomes. uranium ore in mushroom islands or lead ore in swamp biomes etc. Platinum ore occur in combination with other ores from the platinum group like osmium and iridium. So, if you find one of these ores, take a look for the others nearby! It is possible to find gold nuggets in rivers, but really rare! OresAllEasy implements a lot of subtle features to make mining more realistic and a little bit harder, interessting and satisfying -> ItemOres!!!!!! ó.Ò AMAZING! Melting results from ItemOres are 6 nuggets by default (could changed in config file). For better efficiency a grindstone (AE2) is recommended (melting dust to ingot). All ItemOres are full compatible with Tinkers Smeltery (and all pulverizers, crushers etc) like general ore blocks! Note: Uranium items (ItemOre, Ingot etc) are radioactive! Do not touch it to long! There are config options for near everything... still in developmentd. You have an idea for new options? Leave a comment below! If you play with biomes o plenty, you will notice that no more gem ores will be generated. The gems now drop in their respective biomes from granite, andesite or diorite. Amber can be found in sand and gravel on beaches and in forests. Malachite gems can be polished from malachite ore, leather and some quartz dust. This gem drop is disabled by default, because of the new malachite ore and the polishing recipe! Like BoP, with Forestry no longer Apatite Ore will be generated. Now you can get apatit from mining sandstone. A lot of new TinkerMaterials, craftable and castable, for different Mods! OresAllEasy generates a new Chisel stone in the overworld like Marble and Limestone: Soapstone. At the moment there are 3 chisel variations for soapstone, but more coming soon! Do you like black stone decoration like chisel basalt? 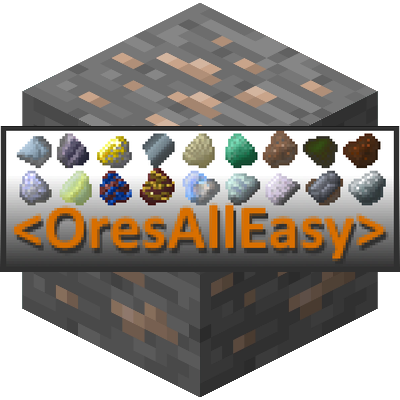 OresAllEasy generates an dark stone basalt variation, put the clean stone variation in the furnace to get the chisel basalt! All item duplicates (ingots, dusts etc. from other mods) will be hidden in the JEI item overview, these items are now completly useless, no recipes, no results, so no reason to spam the item overview. These option take effect on second game start, because JEI read the itemBlacklist before OresAllEasy can add the useless crap. Use your own Grindstone recipes! All you need to do is to build a json recipe and put it into the /configs/oresalleasy/recipes/grindstone/ folder! There is a template recipe in it. Item/Block names convention: modid:item_registryname:meta like minecraft:coal:1 for charcoal item ore minecraft:cobblestone for the cobblestone block. No optional output wanted? - >Remove the optional1 & 2 entries. EnderIO: OresAllEasy creates the config/enderio/recipes/user/sagmill_oresalleasy.xml file to implement compatibility. If you remove OresAllEasy, because of any reason, you have to remove the XML file also, otherwise EnderIO crashes the game at gamestart. Feel free to use this mod in any modpack, public or private. No need to notify or ask, if you do make it public, please link back to this post and post a link to the ModPack-Page in the comments below, so i can test and optimize for better support! This mod was build for my private modpack and is still in development. Bugs are possible, this is a beta version! Vines and stalactites etc. are by BetterUndergrounds and are not part of OresAllEasy! This mod implements new mining features primary, the new End is just an extra feature, but you can disable some worldgen options.